Aceves Navarro was born on September 24, 1931 in Mexico City. In 1950 he studied print and engraving methods at the Esmeralda academy under Isidoro Ocampo. He was an apprentice to David Alfaro Siqueiros and Luis Arenal and helped them during the painting of their murals. His first exhibition was held in 1954 with the title "Nuevas Generaciones", in the Salón de la Plastica at the Palacio de Bellas Artes. By 1957 he had already been awarded first prize at the Salón de Invierno by this important institution. 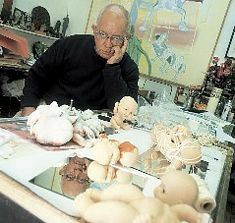 His work was shown at the Bienal de Jovenes held in Paris France in 1959 and then again in 1963. He has been a representative artist from Mexico in many exhibitions throughout the world for his abilities in painting, engraving, sculpture and serigraphy. His work always shows great energy and movement and he likes to use color in a way to create tension.